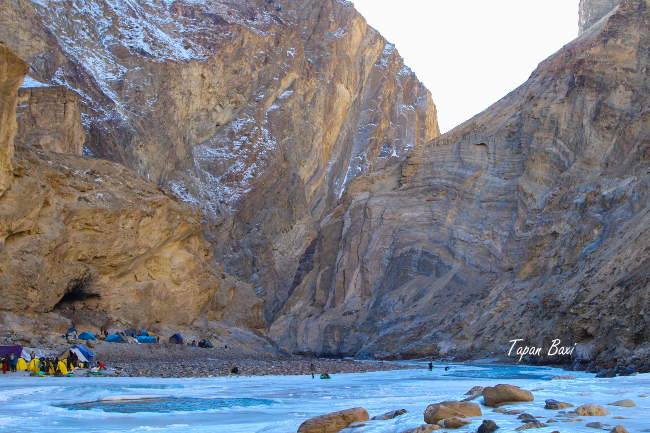 Chadar trek was on my list since 2013. I used to read blogs and envy people. This year somehow I made it happen in the fear that this amazingly wonderful and breathtakingly beautiful trek might become a history in a couple years! I was so excited about trekking this winter highway that I went silent :) The flight from Delhi to Leh was packed with trekkers. The cold desert of Ladakh invited everyone with wide open hands. In Ladakh region there exists a remote and rugged Zanskar valley. 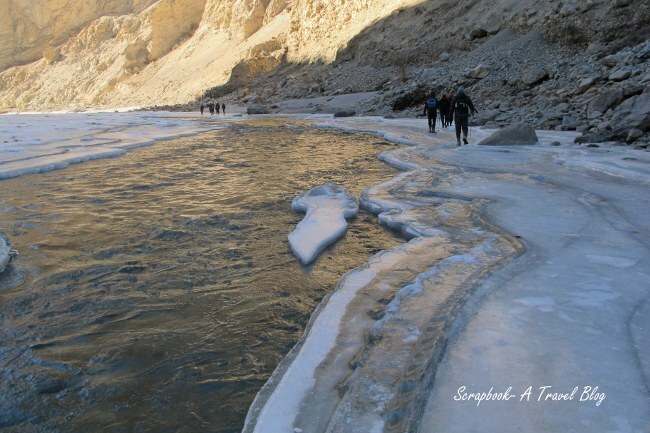 During winter months the temperature reaches up to -40deg C. When all other routes through high passes get impassable due to heavy snowfall, the Zankaris walk over the frozen river to reach the civilization. 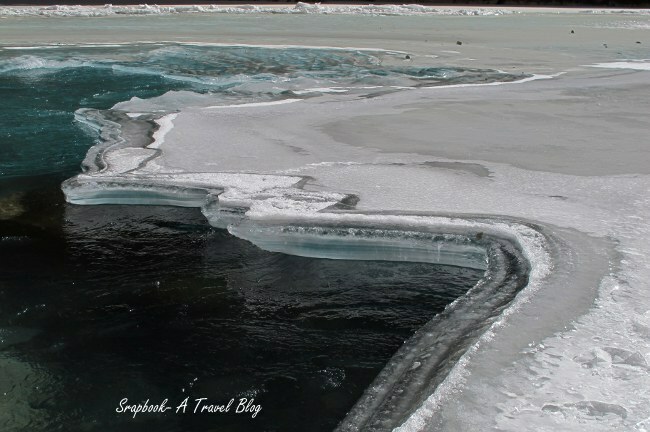 And they call that upper frozen layer of the river- A Chadar (or blanket in English). For them walking over this ice-highway is a necessity. And for us it is a fancy! After acclimatizing for two days finally I was on a Tempo Traveller to the trailhead. The vehicle stopped on the way, landslide clearing was going on. That's where we got the first sight of the river and the Chadar. I stood by the road and watched the river at the bottom of the wide gorge. Silently flowing blue water rimmed by the uneven white frost. Some loose ice moving along the flow gave some movement of life to the frozen landscape. It was cold. The breeze kissed my face as a heads up for the temperature we will be facing inside the gorge. And there we were!! Soon after disembarking from the vehicle we set out on the trail. As I walked over the ice the high mountains shielded me from the busy outside world. The cold was felt in the spine even after wearing six layers of clothes. My nose was happy to breathe some clean and crisp air. The sound of the river was sometimes faint and sometimes a roar depending on the depth of the ice sheet under which it was flowing. Thicker the ice slab fainter the voice. I loved to chase the turns of the gorge. The unseen always fascinates me. You never know what is around the corner! The sun would shine brightly at times blinding my eyesight. 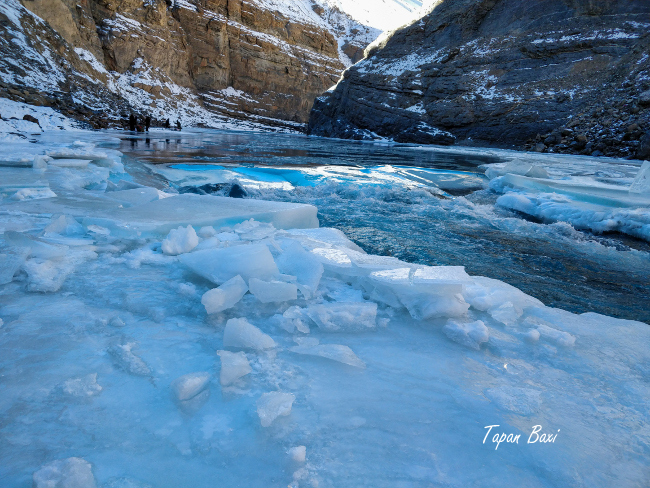 At times I could hear a part of Chadar tearing down and falling into the water which made me rush towards the rocks. Finally my dream of the 'wildest trek' had come true! At every corner the gorge would open up into more prettier canyon. There was not much time to look up and feast on the beautiful landscape. We had to follow the guide on every step. On the first day I fell few times without getting hurt. Every time I fell on the slippery sheet of ice, it was like- a wicked spirit of mountains pulling my leg for fun and laughed at me. And I raised and rubbed off the snow on my pants, shrugged and said "I'm fine" to all the eyes filled with curiosity, amusement and concern. Until that last fall on third day. I felt severe pain in my left hand wrist. When I saw it looked weirdly shaped. The shiny ice didn't look so beautiful at that moment. I fainted for a moment with fear and pain. My trek lead rushed to my help. With another person's help the wrist was straightened and wrapped with an elastic bandage. The mess inside was still unknown. I didn't know what to do. It was so painful and I was having spells of giddiness. Once I even fell on the rocks. Again, I was at a crossroads. I could choose success or to be safe. I was so near to the summit and wanted to see the frozen waterfalls- A wish I carried around for 5 years. Fascination was stronger than fear and pain. I climbed the mountain and descended to the waterfalls with the broken wrist. Thanks to my trek lead who was with me all the time during the summit. I was extremely happy that I made it. The feeling was great! My team was helpful. We had trekkers from different age groups, still bonded well together. I was hand-holded by the trek lead when required. My tent-mate even changed my socks every evening and every morning. Helped me wear and remove shoes. This was my first major injury during the trek and was an eye opener. In the wild, when you are days away from the civilization, you have each other to depend on. You will have to trust one another, there is no option. It doesn't matter who we are in the outside world. CEO of a company or a security guard, nature treats us all alike. And our attitude to share and care makes us heroes or zeroes. There is no room for ego or selfishness. Distress brings out a different kind of human bonding, believe me you cannot name it! The nights are amazing here in the gorge. The eerie silence that attracted me more. At night getting out of sleeping bag is torture. But, once out for attending nature call I enjoyed the unpolluted dark sky studded with zillion stars and view of the gorge under that dim light. Always tried to listen to the unheard whisper of the unseen soul. 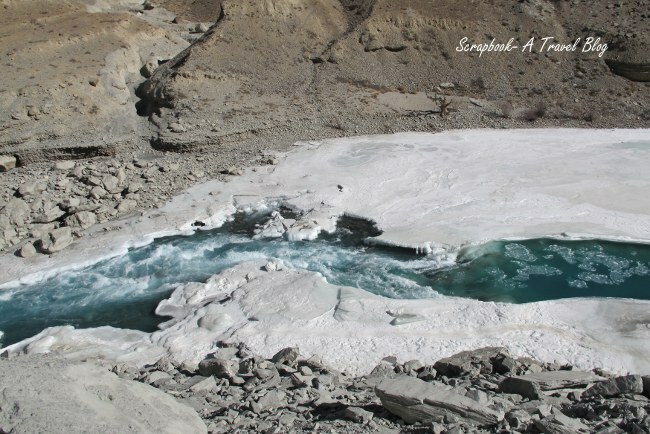 I silently looked out for a pair of green shining dots moving swiftly behind the rocks in the hope of a greetings from a snow leopard! Well, it is called 'The Ghost' right?! If I had seen one the excitement would have gone up to another level. But, the watchful trek lead would shout out- 'get inside the tent, you will catch cold!'. Looking back I wonder ... how did I hold on in that cold when my hand was experiencing excruciating pain!? In worst situations when I didn't know what to do, I go expressionless. I have learnt that from the mountains. From the cold ice! They are expressionless and hence solid! We shouldn't see ourselves as victims because life isn't compassionate with victims. Finally, the trek came to an end, you know- good things never last! In Leh at a local hospital, I had a temporary cast on my ailing wrist. Now my wrist is fixed, a wire is holding all scattered little bones in place. In another month it will be fine. 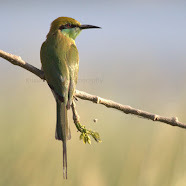 The Chadar- one more feather on my cap! I went with CrazyPeaks for this trek. It was well planned. 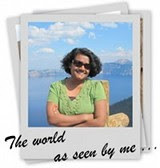 The trek lead Ravi Deshwal is one of the best trek leads I have trekked with in India. He was well informed, kind, friendly and bonded the team very well. I mentioned my wrist was broken and so I could not take many pictures. 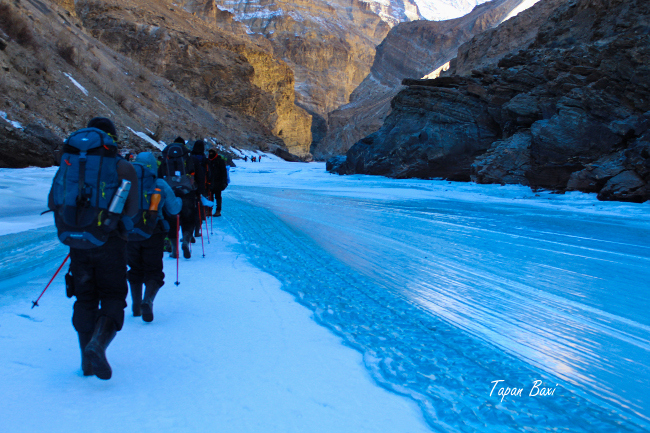 I thank Tapan Baxi, a young trekker and a budding photographer from Ahmedabad who let me use his pictures in my blog. The river of gharials- The Chambal! What an amazing trip. It must have been a bit of a worry being so far from medical care but well done for carrying on. The photos look incredible especially the frozen waterfalls. Yes it was amazing indeed!! And I was worried too. Thank you so much. This is beyond imagination. How incredible. BTW, glad to see you back in blogland. In addition to this I wanted to mention the name of person without whom this trek was impossible..DALA BHAI AND HIS TEAM (Local Zanskari's) We all really thank them for helping and supporting us all during the 5 nights and 6 days on chadar. Hats off to these people. Yes!! True. Anywhere in the world, be it a trek or a vacation, we cannot survive without the support and kindness of the locals. And our character is defined by how much we respect and are greatful to them! Glad you like the post. Wish you good luck for the journey! Fascinating trek , needs courage to do it . Not everyone can imagine . Felt bad about the broken wrist . Amazing trek , felt the cold at home. But I can't to such a trek . Nice to see the frozen waterfall . Thank you for the wonderful photos. Thank you! You can still see it. A road is being built along the gorge! 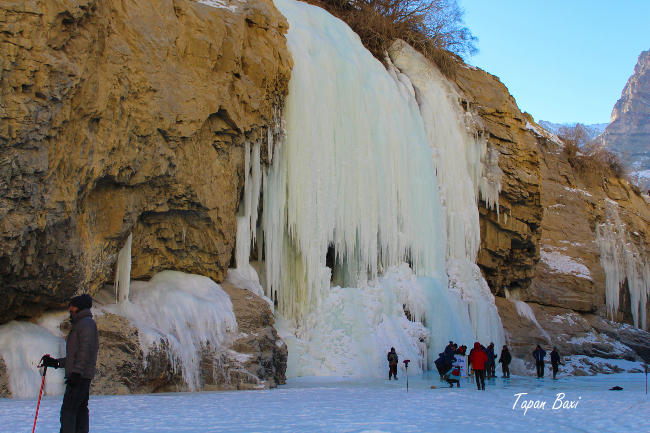 Never imagined a frozen waterfall . Nature is so wonderful , and so horrible too . Hats off to you bold trekkers . Thank you Madam. Yes, nature has two faces. Thank you for your kind words.